These smell so good when they're baking we're surprised they're legal! We have always loved Christmas baking and will never get over that urge. It’s an intense time here for us with not only Christmas coming but also with The Sayers Swindle (drum roll please!) being released earlier this month. So we decided on treats that are quick to make with minimal clean-up. This is one of the few years that we're ready for Christmas and this easy recipe helped. Best of all, the recipe makes two loaves. We'll leave one for Santa. No, Daisy and Lily, those disguises don't fool anyone. Our baking also has to be pleasing to the eye, a cinch to package up as gifts or to serve to visitors. In short, we want it all. Yes, we do. So imagine how thrilling it was last year to discover this little gem from a booklet that showed up mysteriously. The chocolate gingerbread loaves were a big hit, froze beautifully and although they tell you to use the leftovers, cubed in an easy pear triflle, there weren’t any leftovers. But if there ever are, we’ll make that easy trifle out of them. Of course, we could always make another batch because these loaves are even quicker than cookies. Icing sugar, whipping cream or other garnish to suit yourself. Preheat the oven to 325°F (180°C). Grease two 8 1/2 x 4 1/2-inch loaf pans and line a thin strip of parchment down the length of each pan so that it overhangs the edges; set aside. Melt half the chocolate chips in a heatproof bowl set over a saucepan of simmering water. slightly. This is all easier than it sounds! Meanwhile, mix the flour with the sugar, baking soda, cinnamon, ginger, salt, nutmeg and cloves. In a separate bowl, blend the melted chocolate with the oil, buttermilk, vanilla and eggs until smooth. Pour the wet mixture over the dry mixture. (We got that backwards and nothing bad happened!) Stir just until combined. Stir in the remaining chocolate chips. You can reserve two tablespoons or so for over the top of the batter, if you’d like. We tried it both ways. Bake for 50 minutes or until a tester inserted in the centre comes out clean. Wrap tightly with plastic wrap and freeze for up to a month. If you like, when you serve them dust with icing sugar or add a dollop of whipping cream to each slice. But really, they are good just as they are. You can cube the leftovers (if any) and alternate with whipped cream and sliced ripe pears to make a delicious and easy trifle. The loaves make nice little gifts for friends, neighbors, teachers. Make one for a gift and eat one yourself. Here's a little bit more about Victoria Abbott, author of the book collector mysteries. 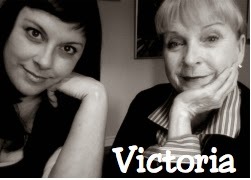 Victoria is an artist and photographer and MJ is the author of 13 books in three other series, as Mary Jane Maffini. They love their book collector mysteries and are happily at work on The Wolfe Widow, third in the series. They're very excited about the The Sayers Swindle which is out this month! The Sayers Swindle, the second in the book collector mysteries is out NOW! You can click here to order The Sayers Swindle! Or here for the Kindle version! Or order through your favorite bookstore - in person or online. Watch the trailer for The Sayers Swindle! 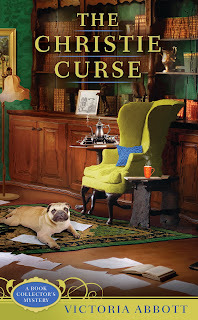 The Christie Curse, the first book collector mystery, launched in March 2013 to great reviews. 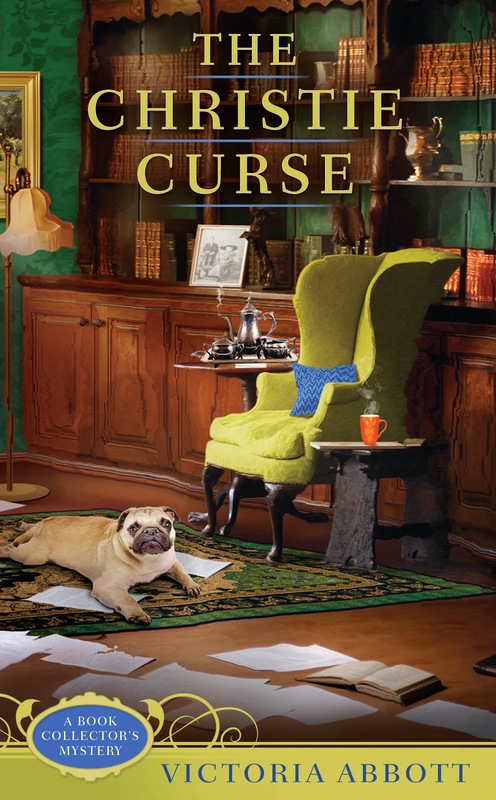 The Christie Curse is also available in Large Print! Tell your local librarian! 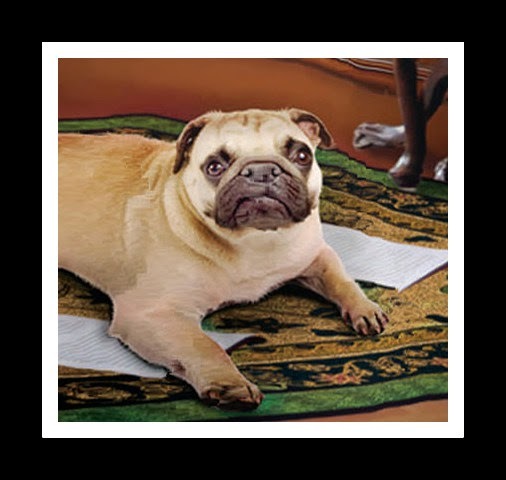 Walter, the pug in the series is a dead ringer for Peachy, Victoria's new best friend. Thanks, Lucy/Roberta! And I'd love to get those 3-D sunglasses sugar cookies. Hope you have a wonderful Christmas and that Santa brings chocolate. This sounds amazing! It will be added to my list of wonderful loaves for my holiday gift baskets. I pinned to my Dessert board, and plan to make it very soon! I will make these today, doctored slightly to be gluten-free. It looks like a treat that combines my favorite things. Merry Christmas! Mmmmm, I can almost smell this! Definitely will be making this recipe! Love the hats on Daisy and Lily. I don't think Reg would stand for that...well, maybe if I offered up a bribe er treat! Merry Christmas to you both! Peg, you took the words right out of my mouth! I can almost smell this and I'm salivating! 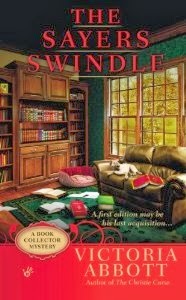 The Sawyer's Swindle is at the top of my TBR pile. Looking forward to it. A recipe that showed up mysteriously? Were milk and cookies missing? I thought I was almost through with my Christmas baking, but now I see that I'm not! BTW, Daisy and Lily, Queenie and Baron think you could be Santa, or his helpers at the very least. Don't you live in the snowy north? Thanks, everyone! I am just emerging from TWO family get togethers and finally checking your comments. I hope you all have a very Merry Christmas with lots of chocolate, cinnamon and small naughty dogs. Thanks for the gluten free adaptation, Adele. I am going to pass it on to my friends. That looks amazing! Love the dogs, too. I just made your recipe and the house smells amazing!!! Sadly, we won't get a slice since I made these for neighbor gifts. The recipe was so easy that perhaps I'll make it again for the New Year.....you can't go wrong with chocolate and gingerbread! Merry Christmas to you and your family and to everyone at MLK.